A California buyer that entered the Denver industrial market a year ago has acquired Park Technology Center in Westminster for $19.3 million, according to public records. An affiliate of Irvine-based The Benedetti Co. paid $132.46 per square foot for the 145,700-sf park at 960-1130 W. 124th Ave. The property consists of four buildings ranging from about 33,400 to 39,400 sf that were approximately 97 percent leased at the time of the sale. FRV CO LLC and First Industrial LP were the sellers. The acquisition follows The Benedetti’s $17.25 million purchase of Turnpike Business Park a year ago. “We had been looking in Denver for quite some time before that. Turnpike has done very well for us, and so we are continuing to look at other acquisitions, primarily industrial or flex acquisitions, in the Denver area,” said Jared Christensen, Benedetti managing director. “This property came across our desk … and fortunately we were able to work a deal out with the seller,” he said, adding Park Technology is a Class A flex development that represents institutional-quality construction and has been very well maintained. “It’s in a great market that has strong fundamentals, and so we felt comfortable in pursing this asset,” Christensen said. CBRE Inc. brokers Jeremy Ballenger, Tyler Carner and Jim Bolt represented the seller. “We were very pleased with how cooperative the seller was, how smooth the transaction was, and we were very pleased with how CBRE handled the sale,” Christensen commented. 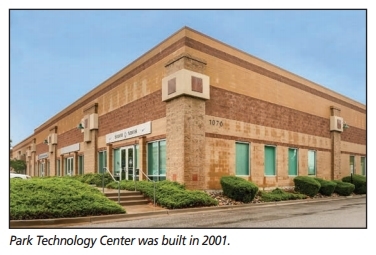 Park Technology Center was built in 2001 and houses approximately 25 tenants, including Source Refrigeration & HVAC Inc. and Isotec Security, each of which occupies about 11,000 sf. The average office finish is 55 percent. The Benedetti Co. is an approximately 55-year-old commercial real estate company that develops, acquires and manages industrial real estate in the Western United States.